Florida Makes Spreading Word On Health Care Law A Challenge : Shots - Health News The state fought hard against Obama's Affordable Care Act. Now Gov. Rick Scott's administration is questioning the use of federally funded navigators to enroll residents in health care exchanges. Florida Gov. Rick Scott has questioned efforts to use federally funded navigators to help people enroll for insurance through the Affordable Care Act. At a community center named for Florida civil rights pioneer Carrie Meek, a few dozen members of Miami's National Church of God gathered over the weekend for a tea party — and to hear from a special guest, Monica Rodriguez of Enroll America. The organization is working to spread the word about the Affordable Care Act, the federal law that will let people without health insurance shop for coverage starting Oct. 1. "By a show of hands," Rodriguez asks the group, "how many people have heard of the Affordable Care Act, or know that there are changes coming in the community with health care coverage?" Only about 5 of the 20 people sitting in the audience raise their hands. It's an indication of the challenge ahead. And state officials aren't helping. Enroll America staffer Rodriguez can't enroll people in plans. She can only tell them about the upcoming deadlines and how to access the exchange. She's finding that many people are unaware of the changes coming and others are hearing bad information. "Some of the misinformation — that you have to belong to a particular political party in order to register," she says. Florida is one of the states where elected officials fought hardest against the law. 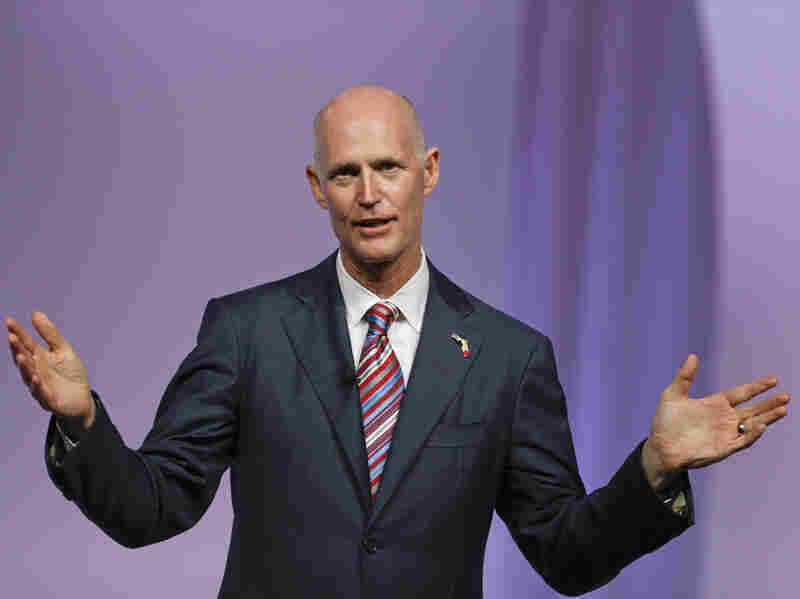 The state has refused to set up its own health care exchange or to expand Medicaid, even though it would provide coverage for nearly 1 million additional Floridians. More recently, Republican leaders in Florida have said they have concerns about navigators, federally funded workers who will help enroll people in health plans. "This is set to take place on Oct. 1, and our citizens need to know that that information that they're giving up could compromise their safety and security," Florida Attorney General Pam Bondi said at a Cabinet meeting last month. Earlier this week, Florida Gov. Rick Scott raised the issue with congressional leaders. In a letter to House Speaker John Boehner and Senate Majority Leader Harry Reid, he talked about a recent incident in Minnesota where a man applying for a job as a navigator was mistakenly sent Social Security numbers and personal information of 2,400 people. As navigators prepare for Oct. 1, the day they can begin signing people up for health plans, Scott's administration recently raised another obstacle. The state health department sent out a directive saying navigators will not be allowed to use any of its offices for outreach and enrolling. "It's unfortunate that scare tactics are being used which may actually prevent people from getting healthy in the first place," says Health and Human Services Secretary Kathleen Sebelius, who has been visiting Florida a lot lately. She was here last week to announce a partnership with CVS Caremark. It's one of several pharmacy chains that have agreed to set up kiosks and train staff to spread the word about the Affordable Care Act. "I'm hopeful that a county health department, a place where people go to get health care and stay healthy, becomes a logical place to connect with people who have coverage needs, who have questions," Sebelius says. "And we hope that the governor will reconsider that decision." Sebelius says it's "absolutely untrue" that the privacy of consumers' personal health information is at risk. And she called barring navigators from health department offices a "disservice" to Floridians. Florida's Health department is standing by its decision, but there are exceptions. Several county health centers across the state will help enroll people. That's because they applied for and received grants to help people sign up for coverage under the Affordable Care Act.